In response to the course’s theme of hyperdensity at the Bartlett, this study attempts to define urban design guidelines, which generate an open space framework for hyperdense urbanism. The objective is to quantify and qualify the potential framework of the strategic juxtaposition of non-built space. The Green Web: primary and secondary connectors; a network of routes that link all public open spaces, functioning as a pedestrian transport system, providing accessibility between origin and destination. Taxonomy of Public Open Space: a catalogue of the types of public open space in a hyper dense urban landscape stating the generative qualities for urban hyperdensity. 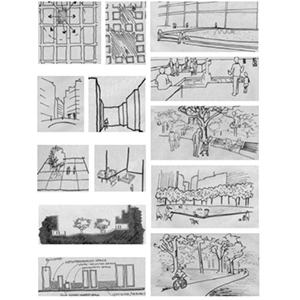 Attributes of Public Open Space in Urban Hyperdensity: the prospect to re-determine and re-define the potential of Public Open Space to appropriate and characterize the urban land-use.